This entry was posted in Midd Blogosphere and tagged Uncategorized on February 4, 2010 by Jason Mittell. This entry was posted in design, Midd Blogosphere and tagged deliverables, examples on October 8, 2009 by Jason Mittell. One of FMMC’s honors graduates this past year, Aaron Smith, wrote a project that warrants broader dissemination, given its timely topic and “prescriptive” tone. Aaron wrote about transmedia storytelling in contemporary television, specifically exploring what lessons can be learned from experiments from the last decade and how future storytellers might devise more successful examples. In the era of convergence, television producers are developing transmedia narratives to cater to consumers who are willing to follow their favorite shows across multiple media channels. At the same time, there still remains a need to preserve an internally coherent television show for more traditional viewers. This thesis offers a model for how transmedia storytelling can coexist with and enhance a television narrative, using Lost as a case study. By building a world to be discovered, creating a hierarchy of strategic gaps, focusing on the unique capabilities of each extension, and using the “validation effect” to reward fans for their cross-media traversals, television/transmedia producers can provide a satisfying experience for hard-core and casual fans alike. This entry was posted in Midd Blogosphere and tagged Current Students, new media, senior project, storytelling, Student Work, television, thesis on July 14, 2009 by Jason Mittell. Come see and hear Senior Work! Thursday 5/7, 7:30 pm in Dana Auditorium: Independent Video Screenings by Waylon D’Mello, David Ellis, Jason Gutierrez, and Matt Leonard. Following the screening at around 8:30 pm on 5/7, we will have a end-of-semester reception in Axinn’s Abernethy Room to celebrate the retirement of Don Mitchell. This entry was posted in Midd Blogosphere and tagged Department Info, Events on May 4, 2009 by Jason Mittell. 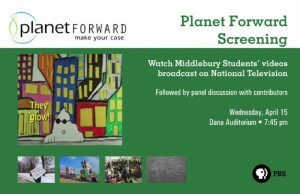 On Wed April 15 at 7:45 pm in Dana, we’ll be viewing the PBS broadcast of Planet Forward. The show is a companion to the website, which features short user-generated videos about global warming and energy issues. The show’s producer and host, Frank Sesno, is a Middlebury alum, former trustee, and parent, and he has involved our current students in the project – two Middlebury videos are featured on the show, and one student appears on a panel. 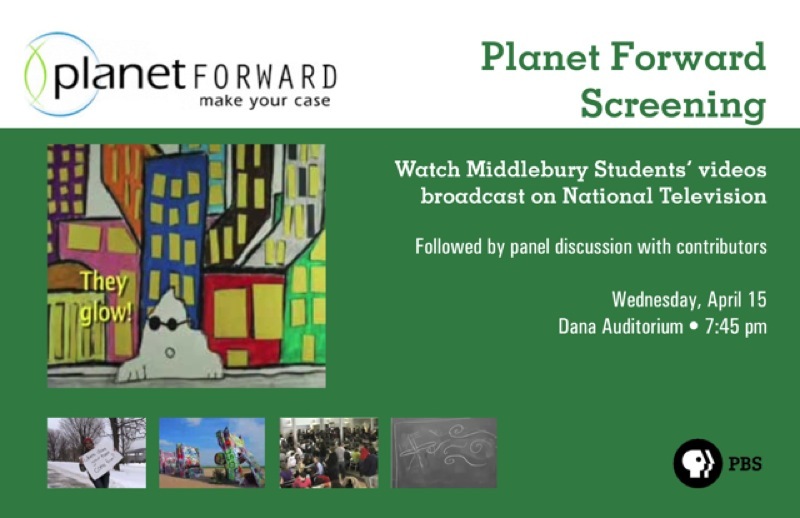 Following the airing, we will watch some of the Middlebury-produced videos in full, and then have a panel discussion about the project and the issues with some of the student video producers, Film & Media Culture professor Jason Mittell, and Environmental Studies professor Jon Isham. On Thursday, April 16 at 7 pm in Axinn 232, come see Wings of Defeat introduced by director Linda Hoaglund. Wings of Defeat brings viewers behind the scenes of World War II’s Pacific theater to reveal the truth about the Kamikaze-the “suicide bombers” of their day. Interviews with surviving kamikaze, rare battle footage and Japanese propaganda reveal a side of WWII never before shown on film. American vets from the greatest generation tell harrowing tales of how they survived attacks. Wings of Defeat shatters the myth of the fanatical kamikaze to reveal a generation of men forced to pay for an empire’s pride with their lives. The film is the 2009 winner of the Organization of American Historians Eric Barnouw Award. This entry was posted in Midd Blogosphere and tagged Events on April 11, 2009 by Jason Mittell. 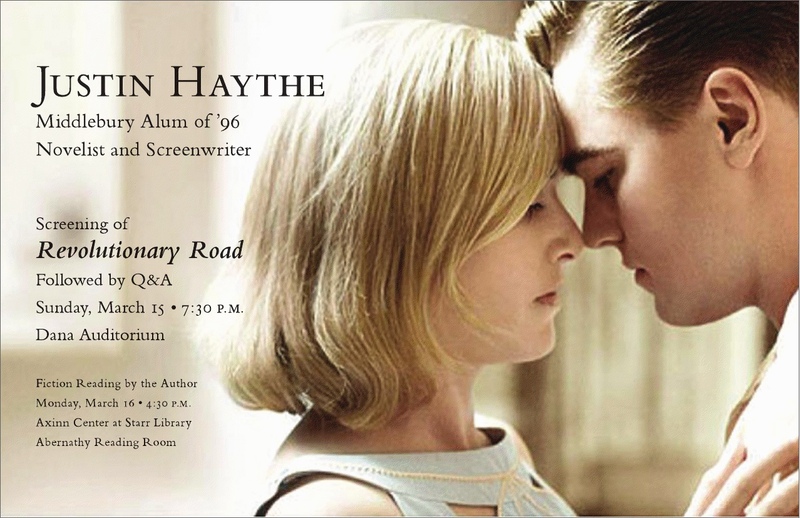 This entry was posted in Midd Blogosphere and tagged Alumni, Events on March 9, 2009 by Jason Mittell. Here is a group of festivals that students might consider entering – the FMMC department cannot speak to the quality of these festivals, but rather just offers links for students to consider. If FMMC majors are interested in submitting to this or other festivals, speak with the FMMC chair as we can help fund the entry fees. The United Film Festivals are calling for your films! Film festivals are an excellent way for young filmmakers to gain exposure and to make contacts. We would like to encourage you to share the following with your student body! The United Film Festivals are where art and creativity come together to create a united film community. Showcasing films which reflect a wide range of topics and experiences, the festival’s focus is to bring together talented filmmakers from diverse backgrounds, thus creating a “United” showcase of creative energy and talent. The 6th annual Tulsa United Film Festival concluded our 2008 season which was our biggest and best one yet. So to continue the excitement we’re thrilled to announce that after two successful years of running United Film Festivals in Los Angeles & New York we are expanding again to include San Francisco, Chicago & London in 2009.. With this growth our rich tradition of screening humorous, touching and sometimes provocative films will be reaching a much wider audience. This is one film festival you won’t want to miss! *This season we will be screening more films and an equal number of narrative & documentary feature length films. *You choose the cities for the 3-festival package! **If you’ve already submitted to one of our 2009 festivals, and are interested in one of these specials, contact us and we’ll deduct the amount you’ve spent. *Check individual festival websites for submission deadlines. This entry was posted in Midd Blogosphere and tagged Festivals, Opportunities on March 6, 2009 by Jason Mittell.